Download "2014 Comprehensive Brochure. 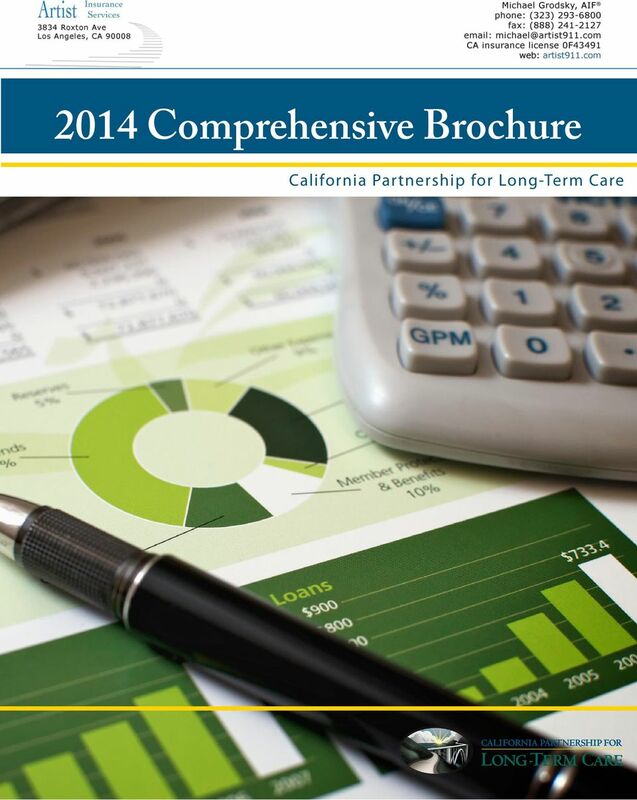 California Partnership for Long-Term Care"
7 2014 COMPREHENSIVE BROCHURE 5 Personal Resources: Most people pay long-term care expenses from their own income and resources. When care is provided by family members and friends at home, other costs such as those for skilled care, equipment, transportation and other costs not paid by Medicare are also paid from the patient s personal income or savings. People who use up their assets paying for long-term care are spending down and may become eligible for Medi-Cal as a result. 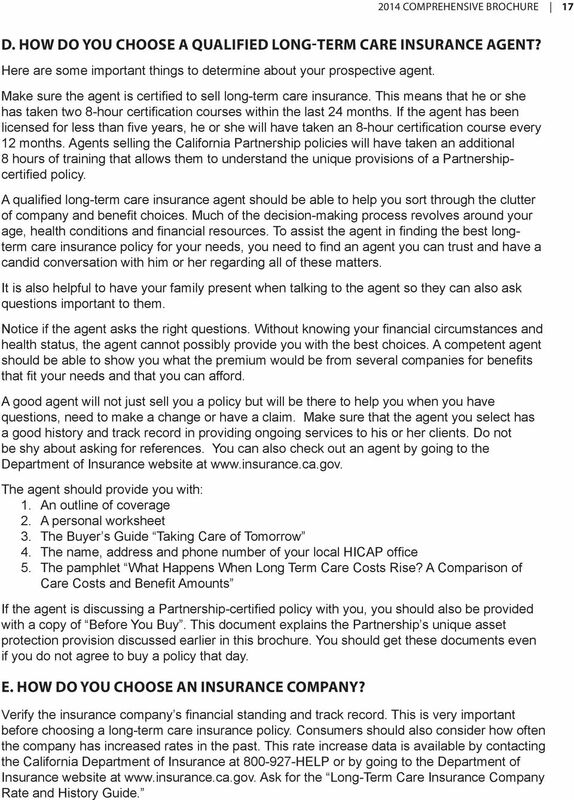 SECTION TWO: Partnership-Certified Long Term Care Insurance Policies A. 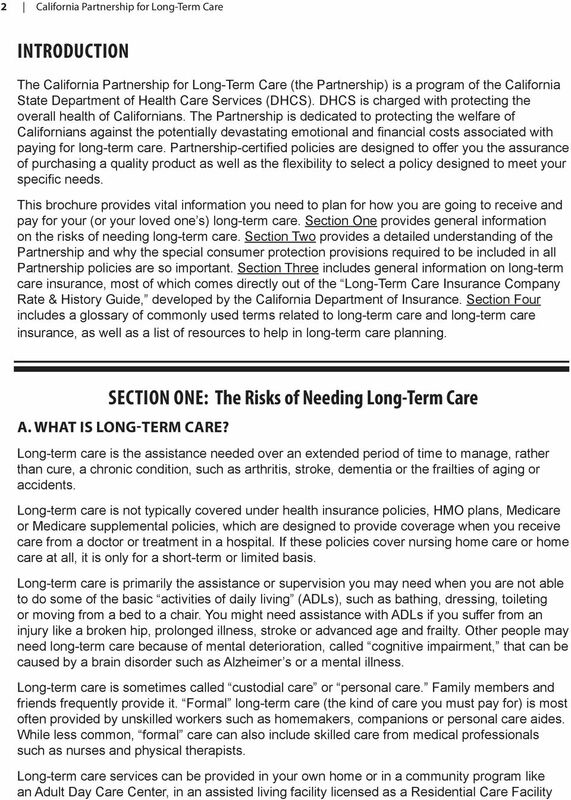 WHAT IS THE CALIFORNIA PARTNERSHIP FOR LONG-TERM CARE? The California Partnership for Long-Term Care is an innovative partnership between consumers, the state of California and three private insurance companies, plus the California Public Employees Retirement System (CalPERS). These insurers offer long-term care policies that meet special requirements set by the DHCS. Companies participating in the Partnership must have their Partnership policies approved by both the Department of Insurance and the DHCS. The CalPERS policy is only approved by DHCS. Each Partnership-approved policy includes high quality insurance benefits to help pay for the care you may need and automatic inflation protection to ensure that the benefits keep pace with the rising cost of care. Partnership policies also include a unique state guaranteed asset protection feature that protects you against impoverishment due to the costs of long-term care, even if you use up all the benefits of your policy. B. WHAT IS LONG-TERM CARE INSURANCE? High quality long-term care insurance will pay the majority of the costs for a nursing facility or residential care facility. A high quality policy that includes coverage for care at home will provide a meaningful amount of money to help pay for long-term care services to supplement the care provided by your friends or family. C. WHAT TYPES OF POLICIES ARE AVAILABLE UNDER THE PARTNERSHIP? Two types of Partnership-certified policies are available. Those that cover residential care facility and nursing facility only, and comprehensive policies that cover care in the home or in the community, in addition to a residential care facility or nursing facility. 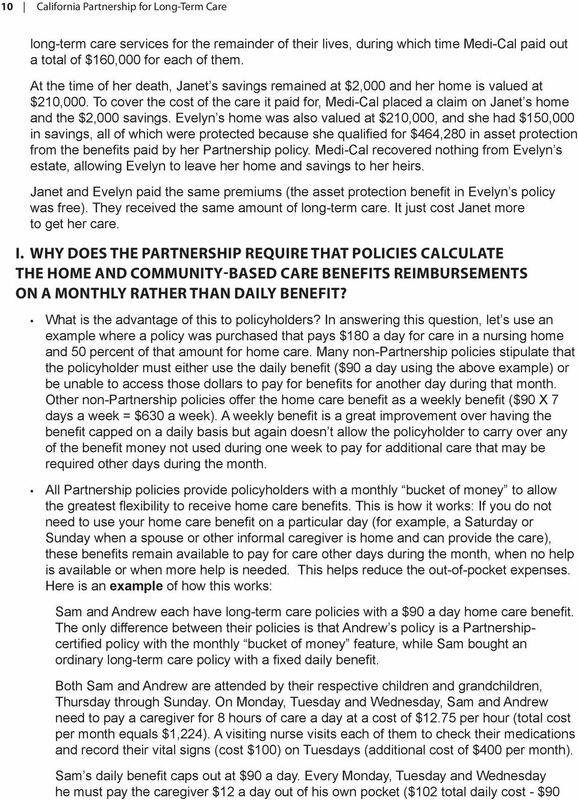 Home care only policies are not available under the Partnership. Residential Care Facility (RCF) and Nursing Facility Only Policies: These policies cover skilled, intermediate or custodial care in a nursing home or similar facility. These policies also pay for board and care in a RCF. Comprehensive Long Term Care Policies: These policies pay for nursing facility care, board and care in a RCF, and home and community-based care. These policies must include at least the following benefits: a nursing facility benefit, a RCF benefit, home health care, adult day care, personal care (assistance with ADLs), homemaker services, hospice services and respite care. You can find definitions for each of these benefits in the glossary at the end of this brochure. 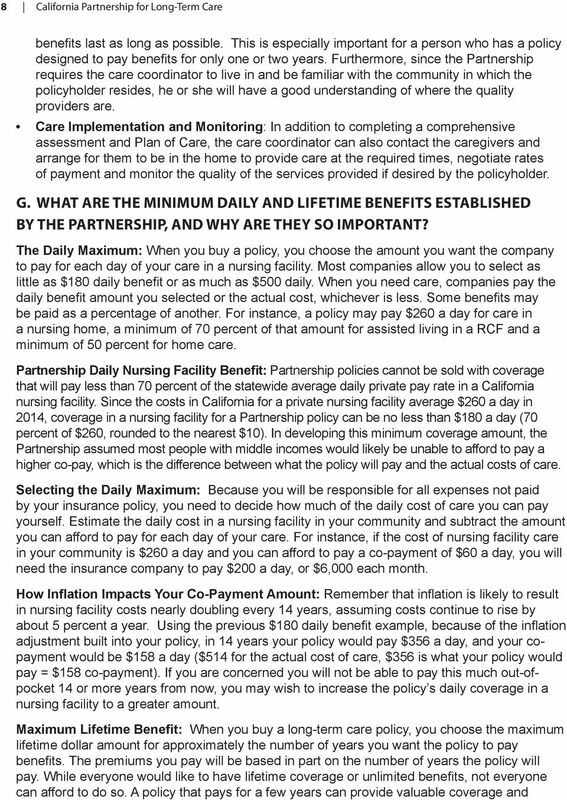 14 12 California Partnership for Long-Term Care Partnership assumed that a person who chose a policy that would pay benefits for a period less than the equivalent of two years in a nursing facility might not easily be able to afford the out- of-pocket expenses associated with longer Elimination Periods. 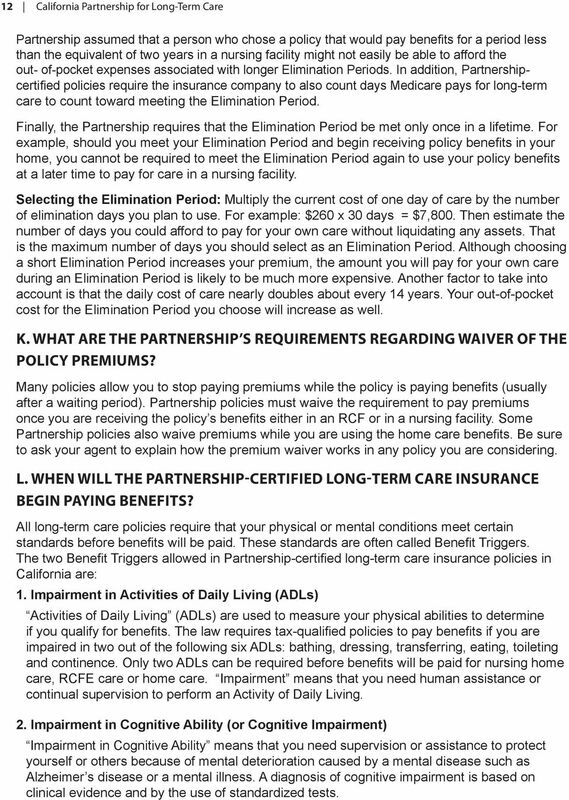 In addition, Partnershipcertified policies require the insurance company to also count days Medicare pays for long-term care to count toward meeting the Elimination Period. Finally, the Partnership requires that the Elimination Period be met only once in a lifetime. For example, should you meet your Elimination Period and begin receiving policy benefits in your home, you cannot be required to meet the Elimination Period again to use your policy benefits at a later time to pay for care in a nursing facility. Selecting the Elimination Period: Multiply the current cost of one day of care by the number of elimination days you plan to use. For example: $260 x 30 days = $7,800. Then estimate the number of days you could afford to pay for your own care without liquidating any assets. That is the maximum number of days you should select as an Elimination Period. 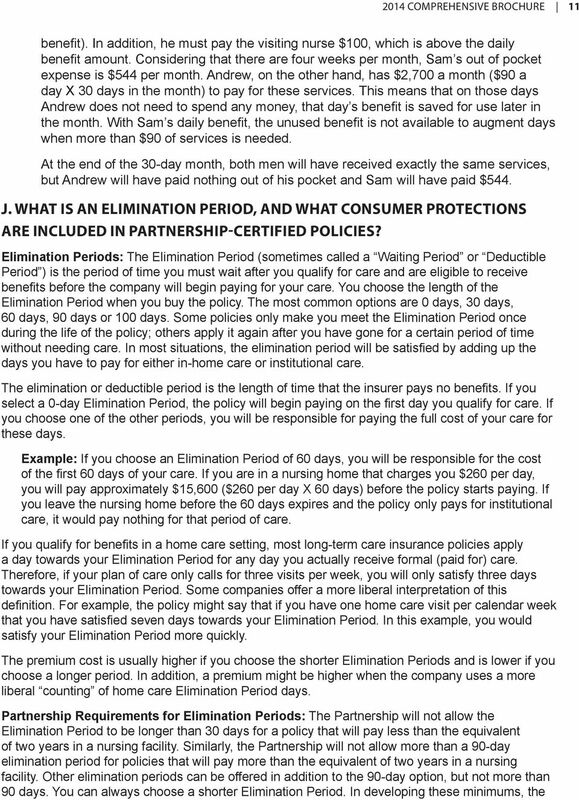 Although choosing a short Elimination Period increases your premium, the amount you will pay for your own care during an Elimination Period is likely to be much more expensive. Another factor to take into account is that the daily cost of care nearly doubles about every 14 years. Your out-of-pocket cost for the Elimination Period you choose will increase as well. K. WHAT ARE THE PARTNERSHIP S REQUIREMENTS REGARDING WAIVER OF THE POLICY PREMIUMS? Many policies allow you to stop paying premiums while the policy is paying benefits (usually after a waiting period). Partnership policies must waive the requirement to pay premiums once you are receiving the policy s benefits either in an RCF or in a nursing facility. Some Partnership policies also waive premiums while you are using the home care benefits. Be sure to ask your agent to explain how the premium waiver works in any policy you are considering. L. WHEN WILL THE PARTNERSHIP-CERTIFIED LONG-TERM CARE INSURANCE BEGIN PAYING BENEFITS? All long-term care policies require that your physical or mental conditions meet certain standards before benefits will be paid. These standards are often called Benefit Triggers. 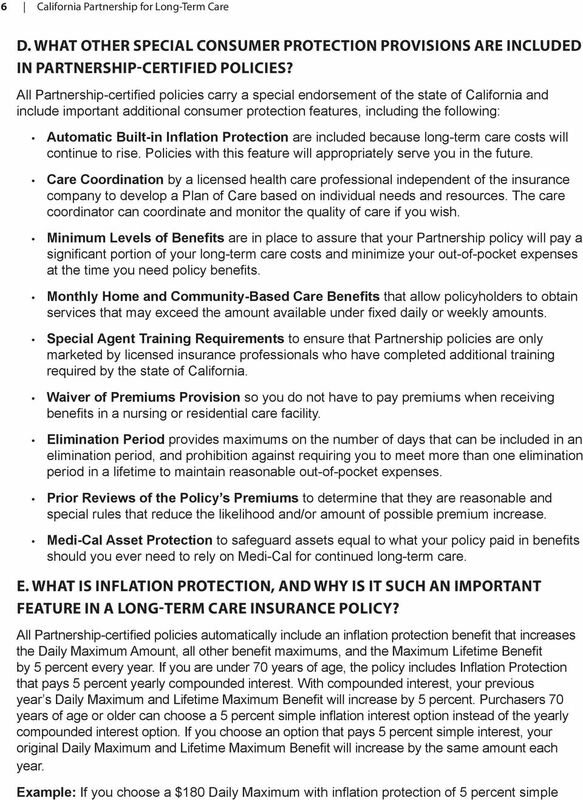 The two Benefit Triggers allowed in Partnership-certified long-term care insurance policies in California are: 1. Impairment in Activities of Daily Living (ADLs) Activities of Daily Living (ADLs) are used to measure your physical abilities to determine if you qualify for benefits. The law requires tax-qualified policies to pay benefits if you are impaired in two out of the following six ADLs: bathing, dressing, transferring, eating, toileting and continence. Only two ADLs can be required before benefits will be paid for nursing home care, RCFE care or home care. Impairment means that you need human assistance or continual supervision to perform an Activity of Daily Living. 2. Impairment in Cognitive Ability (or Cognitive Impairment) Impairment in Cognitive Ability means that you need supervision or assistance to protect yourself or others because of mental deterioration caused by a mental disease such as Alzheimer s disease or a mental illness. A diagnosis of cognitive impairment is based on clinical evidence and by the use of standardized tests. 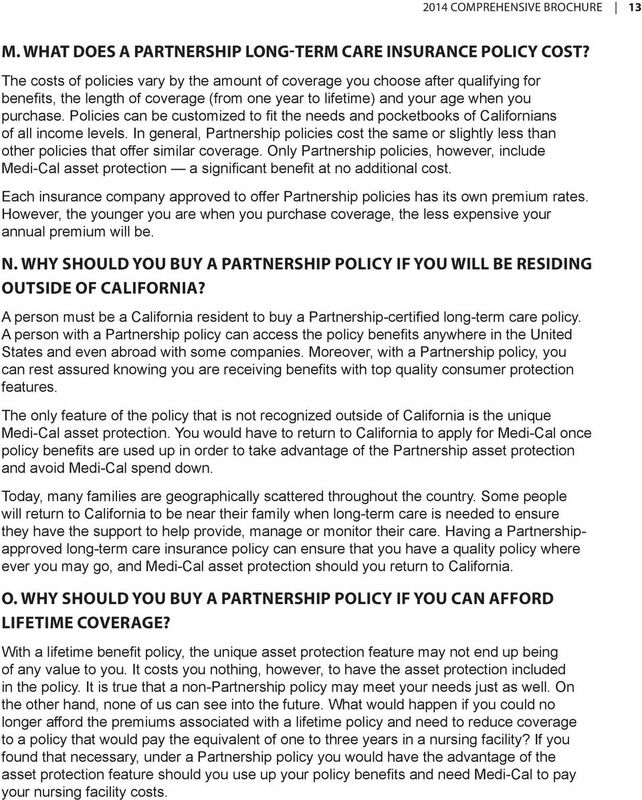 15 2014 COMPREHENSIVE BROCHURE 13 M. WHAT DOES A PARTNERSHIP LONG-TERM CARE INSURANCE POLICY COST? The costs of policies vary by the amount of coverage you choose after qualifying for benefits, the length of coverage (from one year to lifetime) and your age when you purchase. Policies can be customized to fit the needs and pocketbooks of Californians of all income levels. In general, Partnership policies cost the same or slightly less than other policies that offer similar coverage. Only Partnership policies, however, include Medi-Cal asset protection a significant benefit at no additional cost. Each insurance company approved to offer Partnership policies has its own premium rates. However, the younger you are when you purchase coverage, the less expensive your annual premium will be. N. WHY SHOULD YOU BUY A PARTNERSHIP POLICY IF YOU WILL BE RESIDING OUTSIDE OF CALIFORNIA? 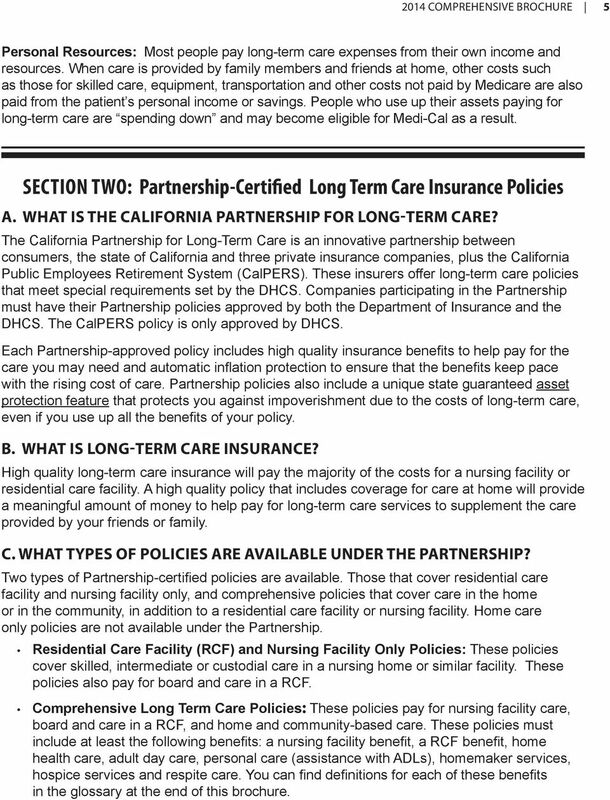 A person must be a California resident to buy a Partnership-certified long-term care policy. A person with a Partnership policy can access the policy benefits anywhere in the United States and even abroad with some companies. Moreover, with a Partnership policy, you can rest assured knowing you are receiving benefits with top quality consumer protection features. The only feature of the policy that is not recognized outside of California is the unique Medi-Cal asset protection. 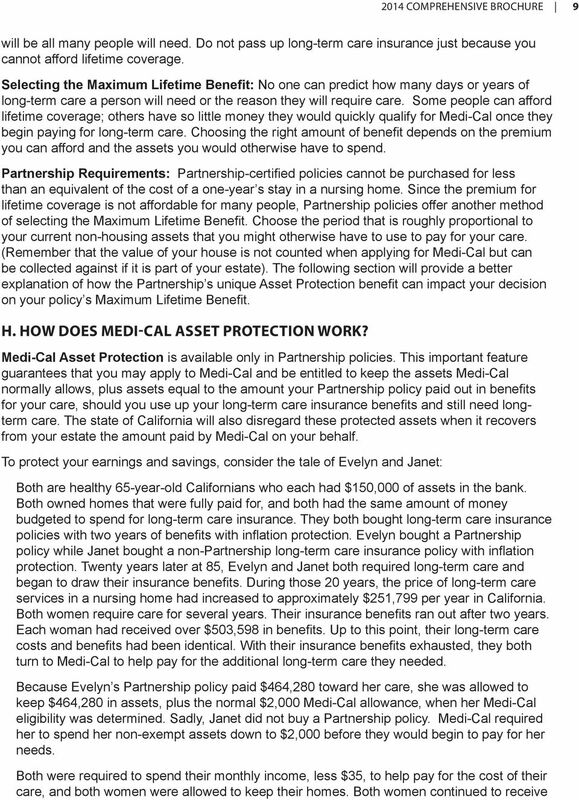 You would have to return to California to apply for Medi-Cal once policy benefits are used up in order to take advantage of the Partnership asset protection and avoid Medi-Cal spend down. Today, many families are geographically scattered throughout the country. Some people will return to California to be near their family when long-term care is needed to ensure they have the support to help provide, manage or monitor their care. Having a Partnershipapproved long-term care insurance policy can ensure that you have a quality policy where ever you may go, and Medi-Cal asset protection should you return to California. O. WHY SHOULD YOU BUY A PARTNERSHIP POLICY IF YOU CAN AFFORD LIFETIME COVERAGE? With a lifetime benefit policy, the unique asset protection feature may not end up being of any value to you. It costs you nothing, however, to have the asset protection included in the policy. It is true that a non-partnership policy may meet your needs just as well. On the other hand, none of us can see into the future. What would happen if you could no longer afford the premiums associated with a lifetime policy and need to reduce coverage to a policy that would pay the equivalent of one to three years in a nursing facility? If you found that necessary, under a Partnership policy you would have the advantage of the asset protection feature should you use up your policy benefits and need Medi-Cal to pay your nursing facility costs. 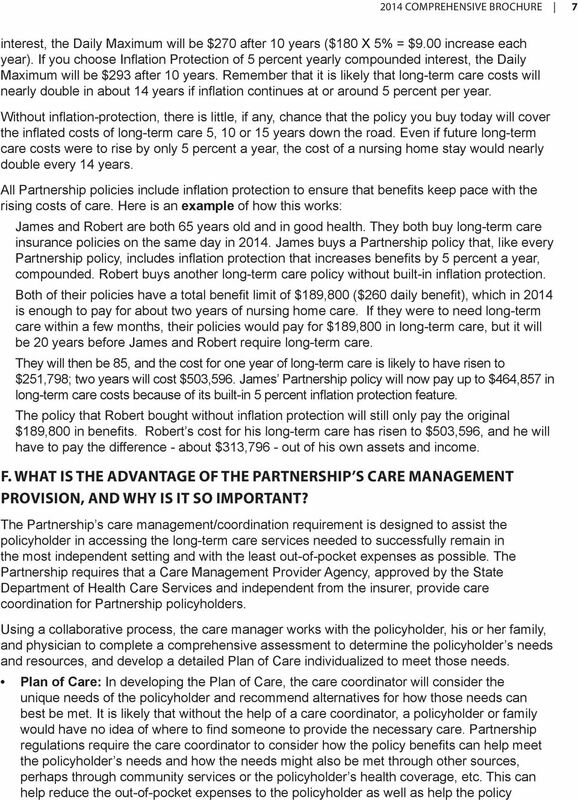 16 14 California Partnership for Long-Term Care P. WHO ENDORSES THE CALIFORNIA PARTNERSHIP FOR LONG-TERM CARE? Many influential California organizations and associations endorse the Partnership program and policies. They include: California Association for Adult Day Services California Association of Area Agencies on Aging California Association of Health Facilities California Association for Health Services at Home California Association of Homes and Services for the Aging California Association of Residential Care Homes California Commission on Aging California Medical Association California Pharmacists Association s Long-Term Care Management Council California Retired Public Employees Association California State Employees Association California State University - Emeritus Retired Faculty Association Community Residential Care Association of California Mt. Zion Institute on Aging Senior Care Network/Huntington Memorial Hospital Q. 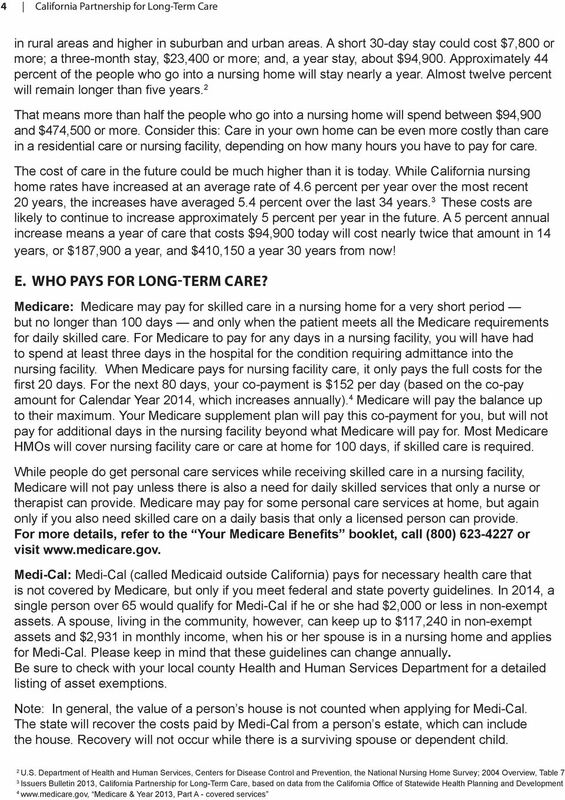 HOW CAN YOU GET MORE INFORMATION ON LONG-TERM CARE OR THE CALIFORNIA PARTNERSHIP FOR LONG-TERM CARE? 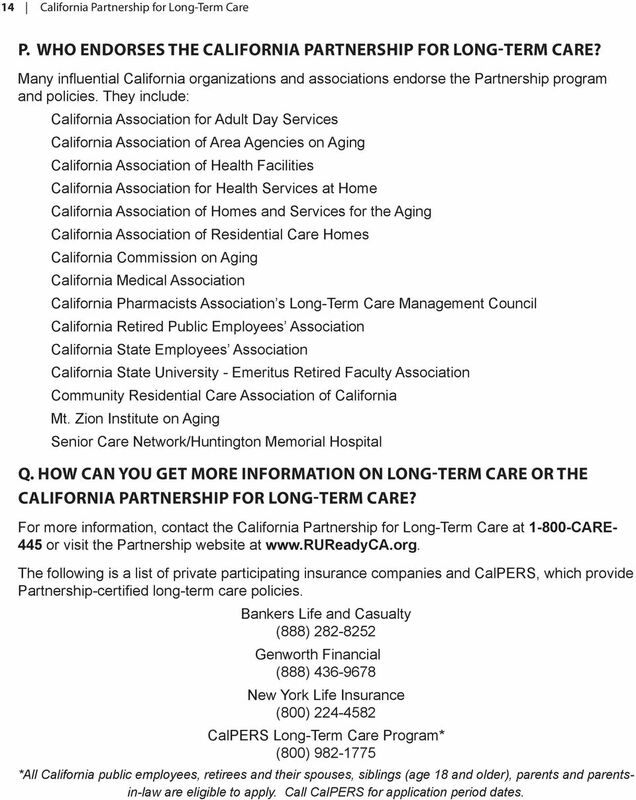 For more information, contact the California Partnership for Long-Term Care at CARE- 445 or visit the Partnership website at The following is a list of private participating insurance companies and CalPERS, which provide Partnership-certified long-term care policies. Bankers Life and Casualty (888) Genworth Financial (888) New York Life Insurance (800) CalPERS Long-Term Care Program* (800) *All California public employees, retirees and their spouses, siblings (age 18 and older), parents and parentsin-law are eligible to apply. Call CalPERS for application period dates. 17 2014 COMPREHENSIVE BROCHURE 15 SECTION THREE: Consumer Protections Required in All Long-Term Care Insurance and Other Considerations When Purchasing a Policy A. 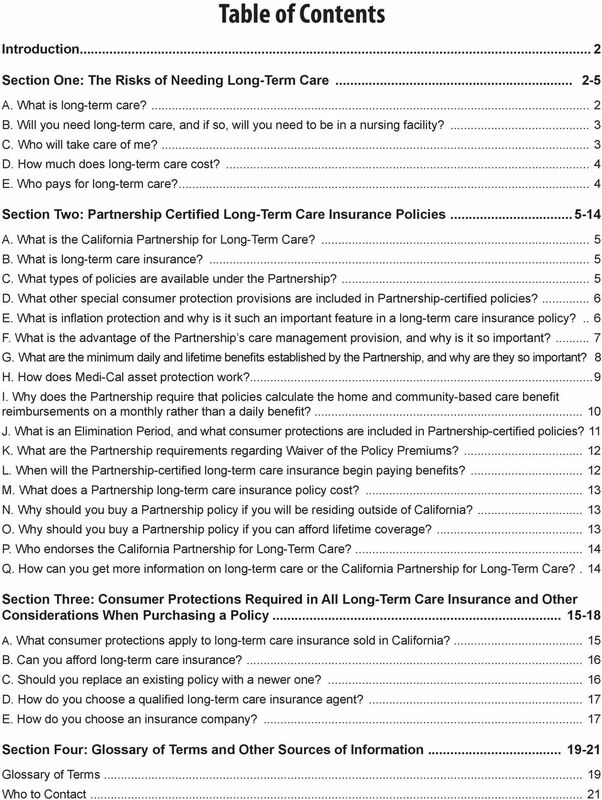 WHAT CONSUMER PROTECTIONS APPLY TO LONG-TERM CARE INSURANCE SOLD IN CALIFORNIA? California has a long list of consumer protections, some of which are listed here. Guaranteed Renewable: This means that the insurer may not cancel coverage unless premiums are not paid on time. Coverage may not be cancelled because of age or health, but the company retains the right to increase premiums if the Department of Insurance approves the increase. Duty of Honesty, Good Faith and Fair Dealing: Every long-term care insurer and insurance agent owes every applicant and policyholder a duty of honesty, good faith and fair dealing. Among other things, this duty means that advertisements and other marketing materials may not be misleading. Applicants must be given fair and accurate comparisons of policies. No excessive insurance or inappropriate replacement policies may be sold. High-pressure sales tactics are expressly forbidden, and insurance agents must receive special training in order to sell long-term care insurance. 30-Day Free Look: Purchasers of individual long-term care insurance (except purchasers through employer groups or trade associations) have the right to review the policy or certificate for 30 days after they receive it. If the purchaser decides not to buy the insurance, for any reason, it can be returned to the insurer or the agent without explanation for a full refund. (Note: Always keep a record of the date the policy was received and the date it was returned, or return it by certified mail.) Outline of Coverage: An outline of coverage is a summary of the terms of a policy or certificate that can be used to compare different policies. An Outline of Coverage must be delivered at the time of an insurance agent s first presentation. When purchasing insurance through the mail, the Outline of Coverage must be delivered at the time the application or enrollment form is received. It is not necessary to fill out an application in order to get the Outline of Coverage. An agent or insurance company should be readily willing to provide an Outline of Coverage. Changing Your Benefits: If you find that you cannot afford to continue paying the same amount of premiums for the coverage you bought, you have the right to reduce your benefits in return for a lower premium. Companies must, at a minimum, let you reduce the daily benefit or change the number of years the company will pay to reduce the premium to an amount that is more affordable. 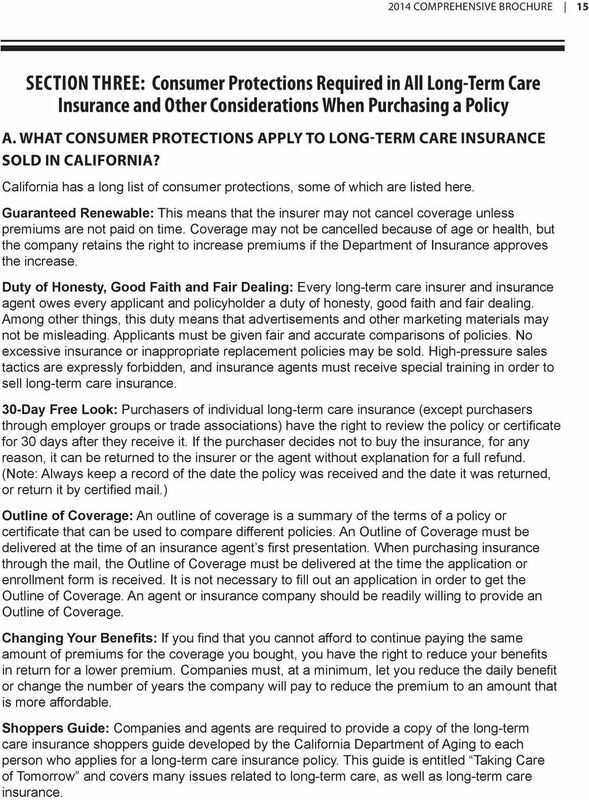 Shoppers Guide: Companies and agents are required to provide a copy of the long-term care insurance shoppers guide developed by the California Department of Aging to each person who applies for a long-term care insurance policy. This guide is entitled Taking Care of Tomorrow and covers many issues related to long-term care, as well as long-term care insurance. 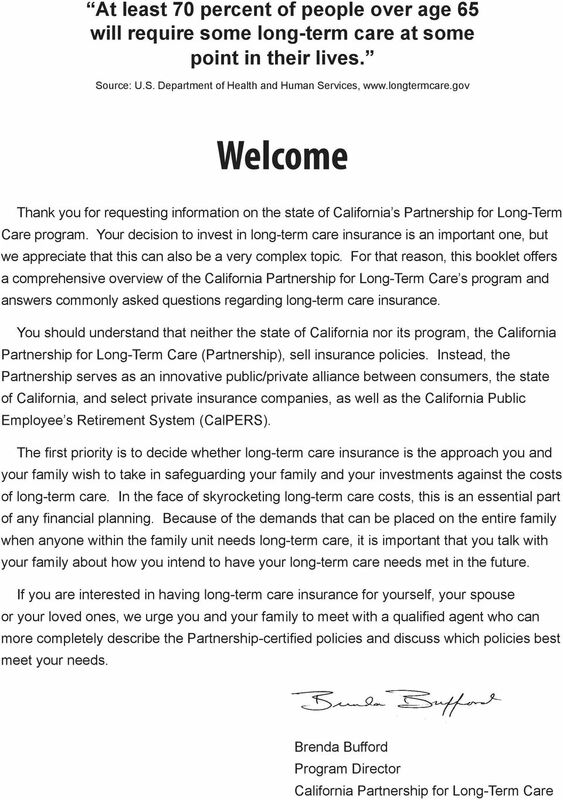 18 16 California Partnership for Long-Term Care Checklist and Counseling Information: Agents are required to leave a number of documents with the purchaser of a long-term care insurance policy. Among the documents you should get is a copy of a Personal Worksheet that helps you understand some of the issues related to purchasing long-term care insurance, and the name, address and local phone number of the Health Insurance Counseling and Advocacy Program (HICAP) office nearest you where you can receive, free of charge, information and counseling about long-term care insurance. B. CAN YOU AFFORD LONG-TERM CARE INSURANCE? Most people should not spend more than seven percent of their total annual income on annual premiums for a long-term care insurance policy. Estimate your discretionary income by subtracting your fixed expenses from your annual income. Then decide how much of that discretionary income you want to spend on long-term care insurance premiums. Remember that after retirement, income often does not keep pace with inflation. As you age, you are more likely to have unexpected medical expenses, such as prescription drugs or other medical costs that may not be covered by your medical insurance. The loss of a spouse can also result in reduced income. Select a premium you can comfortably afford. Take into consideration that your premium may increase during the years you own the policy. When talking to an agent about long-term care insurance, it is important for you and your agent to understand your financial circumstances so that he or she can tailor a plan best suited to your needs. C. SHOULD YOU REPLACE AN EXISTING POLICY WITH A NEWER ONE? The advantage of replacing an older policy is that newer policies may offer benefits that are more desirable, have better features and fewer restrictions. Assisted living in a residential care facility, home care benefits, inflation protection and no requirements for a prior hospital stay are some of the benefits and features being offered in current long-term care products. However, just because a policy is newer does not necessarily mean it is better than the one you have. One disadvantage to replacement is that the insurance company will charge higher premiums because you are older than you were when you bought your original policy. In addition, if you have any pre-existing conditions or are 80 years old or more, companies may refuse to issue new coverage. If you are still insurable, you might consider adding new coverage to the benefits you already have or buying an additional policy to supplement your existing benefits. Even very old policies still provide a benefit, and the premiums are often much less expensive than a premium for a brand new policy at an older age. Before you add benefits to an existing older policy, you should check with your agent, company or tax advisor to see if you will lose the grandfathered tax status granted policies purchased before January 1, If you are considering replacing an older policy, first ask your current agent or insurer if you can update your coverage. If you replace your policy with the same company, you are likely to get a credit against the new premium for some percentage of the premiums you have already paid. Another possibility is to keep the older policy and add a newer one to supplement the daily benefit in the old policy, or add some of the newer benefits not in the older policy. Adding another policy will not cause the loss of any tax advantages you have for the older policy. Whenever you are considering replacing a policy, consulting a HICAP counselor is recommended. 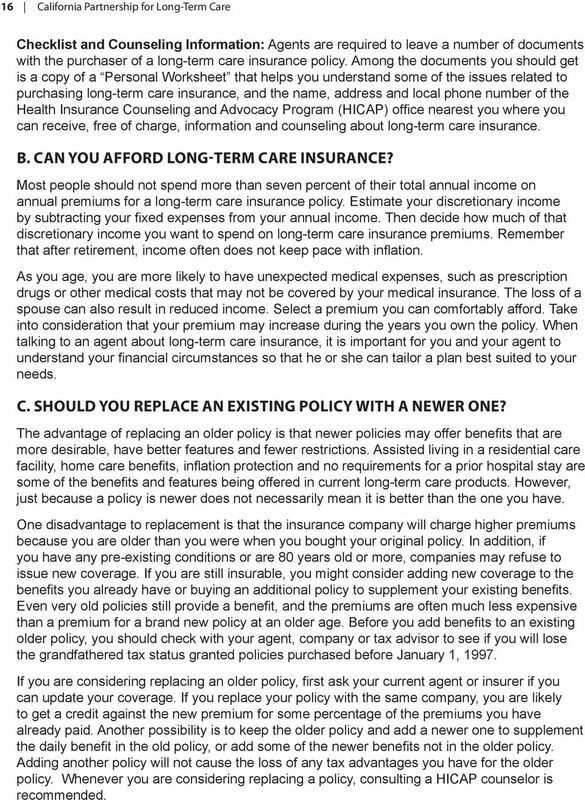 19 2014 COMPREHENSIVE BROCHURE 17 D. HOW DO YOU CHOOSE A QUALIFIED LONG-TERM CARE INSURANCE AGENT? Here are some important things to determine about your prospective agent. Make sure the agent is certified to sell long-term care insurance. This means that he or she has taken two 8-hour certification courses within the last 24 months. If the agent has been licensed for less than five years, he or she will have taken an 8-hour certification course every 12 months. Agents selling the California Partnership policies will have taken an additional 8 hours of training that allows them to understand the unique provisions of a Partnershipcertified policy. A qualified long-term care insurance agent should be able to help you sort through the clutter of company and benefit choices. Much of the decision-making process revolves around your age, health conditions and financial resources. To assist the agent in finding the best longterm care insurance policy for your needs, you need to find an agent you can trust and have a candid conversation with him or her regarding all of these matters. It is also helpful to have your family present when talking to the agent so they can also ask questions important to them. Notice if the agent asks the right questions. Without knowing your financial circumstances and health status, the agent cannot possibly provide you with the best choices. A competent agent should be able to show you what the premium would be from several companies for benefits that fit your needs and that you can afford. A good agent will not just sell you a policy but will be there to help you when you have questions, need to make a change or have a claim. Make sure that the agent you select has a good history and track record in providing ongoing services to his or her clients. Do not be shy about asking for references. You can also check out an agent by going to the Department of Insurance website at The agent should provide you with: 1. An outline of coverage 2. A personal worksheet 3. The Buyer s Guide Taking Care of Tomorrow 4. The name, address and phone number of your local HICAP office 5. The pamphlet What Happens When Long Term Care Costs Rise? A Comparison of Care Costs and Benefit Amounts If the agent is discussing a Partnership-certified policy with you, you should also be provided with a copy of Before You Buy. This document explains the Partnership s unique asset protection provision discussed earlier in this brochure. You should get these documents even if you do not agree to buy a policy that day. E. HOW DO YOU CHOOSE AN INSURANCE COMPANY? Verify the insurance company s financial standing and track record. This is very important before choosing a long-term care insurance policy. Consumers should also consider how often the company has increased rates in the past. This rate increase data is available by contacting the California Department of Insurance at HELP or by going to the Department of Insurance website at Ask for the Long-Term Care Insurance Company Rate and History Guide. 20 18 California Partnership for Long-Term Care Financial Standing: A company s size and ratings are important factors to take into consideration when making your long-term care insurance choice. While an A+ rating is no guarantee the company will remain in business or not increase their premiums, companies with superior ratings are more likely to have the ability to pay future claims. 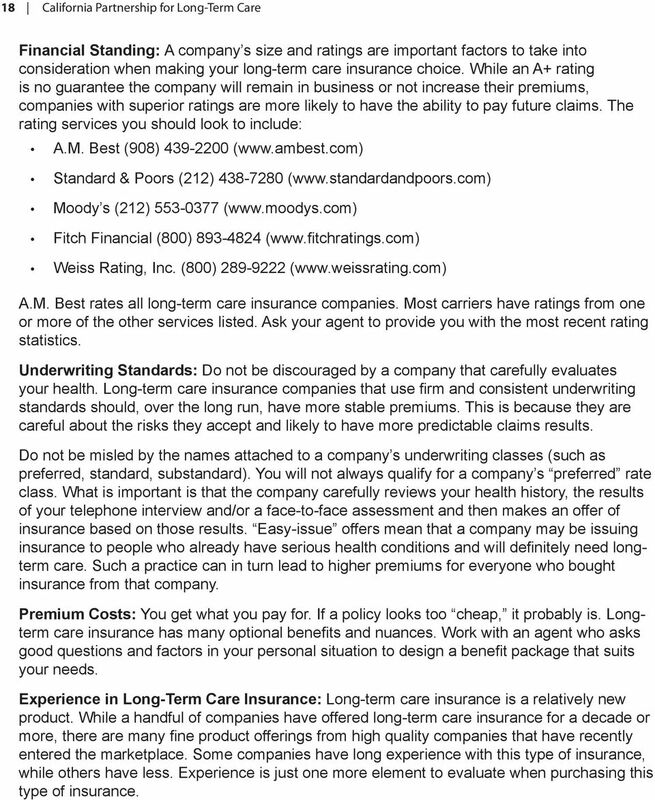 The rating services you should look to include: A.M. Best (908) ( Standard & Poors (212) ( Moody s (212) ( Fitch Financial (800) ( Weiss Rating, Inc. (800) ( A.M. Best rates all long-term care insurance companies. Most carriers have ratings from one or more of the other services listed. Ask your agent to provide you with the most recent rating statistics. Underwriting Standards: Do not be discouraged by a company that carefully evaluates your health. Long-term care insurance companies that use firm and consistent underwriting standards should, over the long run, have more stable premiums. This is because they are careful about the risks they accept and likely to have more predictable claims results. Do not be misled by the names attached to a company s underwriting classes (such as preferred, standard, substandard). You will not always qualify for a company s preferred rate class. What is important is that the company carefully reviews your health history, the results of your telephone interview and/or a face-to-face assessment and then makes an offer of insurance based on those results. Easy-issue offers mean that a company may be issuing insurance to people who already have serious health conditions and will definitely need longterm care. Such a practice can in turn lead to higher premiums for everyone who bought insurance from that company. Premium Costs: You get what you pay for. If a policy looks too cheap, it probably is. Longterm care insurance has many optional benefits and nuances. Work with an agent who asks good questions and factors in your personal situation to design a benefit package that suits your needs. Experience in Long-Term Care Insurance: Long-term care insurance is a relatively new product. While a handful of companies have offered long-term care insurance for a decade or more, there are many fine product offerings from high quality companies that have recently entered the marketplace. Some companies have long experience with this type of insurance, while others have less. Experience is just one more element to evaluate when purchasing this type of insurance. Planning for Long-Term Care Are You R e A d Y? 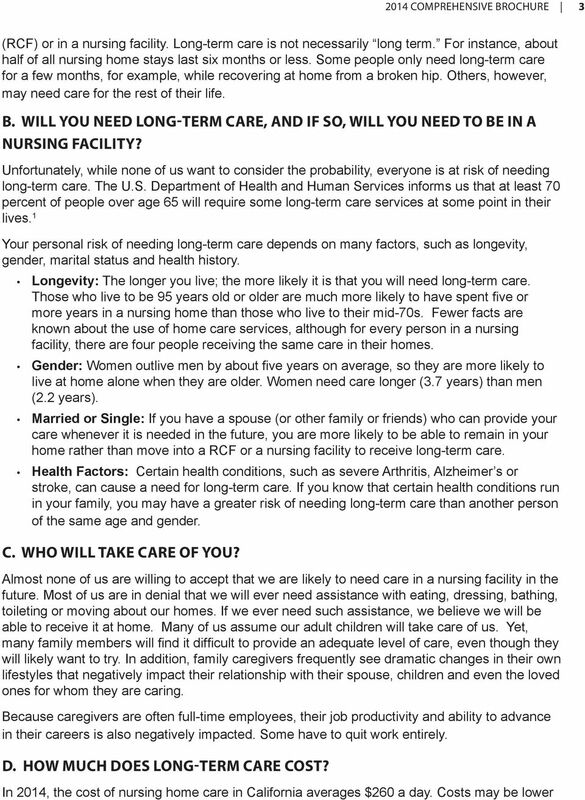 Planning for Long-Term Care Are You Ready? Facing a Growing ReaLITY Fire, auto and health insurance are some of the options you may consider to protect against unforeseen and costly emergencies and disasters.